The gap scheme, or gap blocking as it’s otherwise known, is a popular scheme among offenses – both power and spread. What is the gap scheme? The gap scheme is when offensive lineman use leverage as opposed to power to block another player. It includes blocking a defender “down” away from the play , creating a natural wall between the defender and the ball carrier. 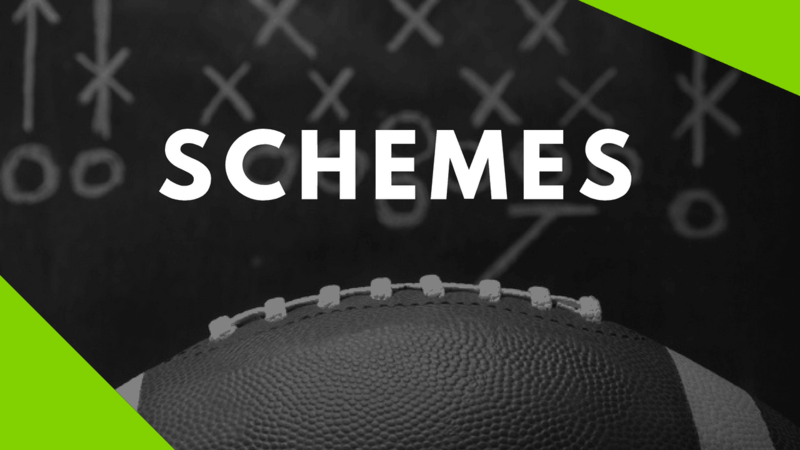 In this article we’re going to dive into the fundamentals and principals of the gap scheme and how you can implement them into your offense. Why Run The Gap Scheme? 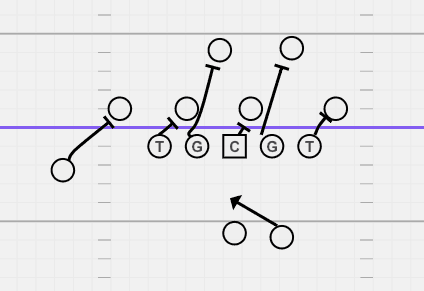 The gap scheme is great for all types of lineman variations. 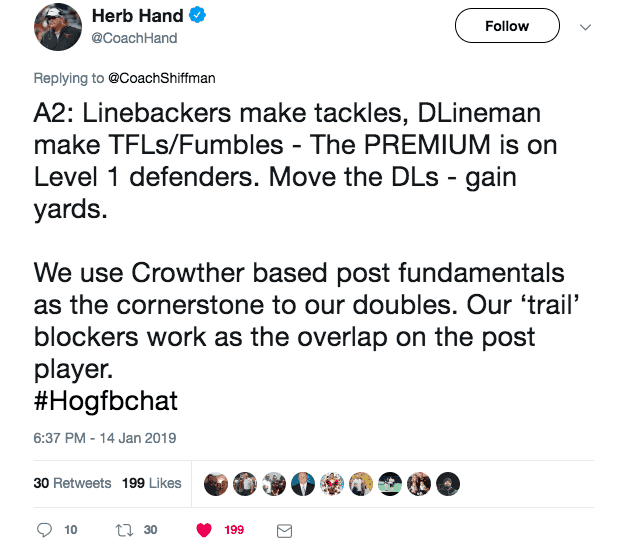 Small, big, slow, or fast lineman are fit for the gap scheme. As mentioned above, the gap scheme relies solely on “gap” blocks, or down blocks. This requires players to get their head and hands on the side of the player and use leverage to drive the player out of the hole. Why this works with all types of lineman, is because the player creates a natural barrier between the defender and the ball carrier. In order to lose in a down block situation, the defender must either fight over it, or fight around it. 90% of the time when the defender fights around it, they will take themselves out of the play. As a defender, fighting over a down block requires practice time and quick reaction skills. It’s a skill that even professional players have a tough time reacting to. Most offensive plays use a 1/2 line gap scheme, with the added combination of pulling guards. However, for reference to the gap scheme, we created the diagram above from 11 personnel to give a extreme example of the gap scheme. As you can see, the play is being run to the left side. The offensive line will block the player that is in the gap opposite the play (the right side). The two tackles and center will block the defensive lineman away from the play. The H-back will also block down on the play-side defensive end. The tricky block is the guards getting to the linebackers. In years past, players were able to cut block at the second level, making this block a bit easier. Now because of the rule changes, players must take a better angle to the linebackers in order to make the block. The Play Side: Simple gap scheme with the play side tackle, guard and center blocking away from where the ball is being run. Depending on the scheme, coaches may have the play side guard attack the play side linebacker or far side linebacker. The Back Side: Coaches have gotten creative in the way they utilize the back side lineman. Along with tagging the plays with RPO’s and Read Options, the back side linebacker and defensive lineman can be held away from the plays in many ways. In this play, the guard is going to kick out the play side defensive end and the tackle will wrap up through the hole and take care of any line backers who trail the play. Create basic rules for your gap scheme to alleviate any mental blocks from offensive lineman. One thing to keep in mind is how to attack teams that will shoot the guard gaps and how it will affect the blocking/pull scheme. Below is a great video from the youtube channel Athlete Builder on how to properly fit up a down block. Utilizing the gap scheme is important to blocking big strong defensive lineman. Whether you’re a power team or a zone team, gap principals are easy to implement and execute on the fly. 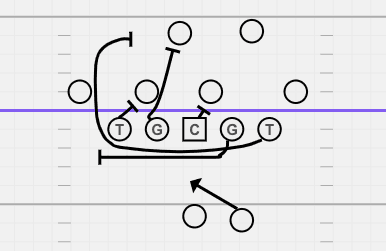 Implementing a counter play or a single guard belly play with a gap scheme attached could be a nice wrinkle for an offense. How do you block up gap schemes? Let us know in the comment section below! What’s Better, Gap or Zone Schemes? What Front’s Do Gaps Schemes Work Best Against? Gap Schemes work against any front. The more defensive lineman, the better, as it decreases the chances of a down block being missed. With 3 man fronts, it requires lineman to get to the second level, which increase the chance of a block being missed.